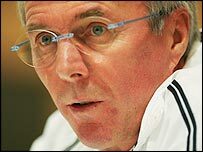 England coach Sven-Goran Eriksson has won his battle to secure a four-week break before the 2006 World Cup finals. The 2006 FA Cup final - the first game at the new Wembley - has been brought forward a week to Saturday 13 May, and the Premiership will end a week early. Sides in the Uefa Cup will not play replays in the fifth or sixth round of the FA Cup while Champions League teams will not have sixth-round replays. Any ties affected will go to extra-time and penalties if necessary. The arrangement will only be in effect next season. In a statement, the Football Association said: "This was deemed to be the only available solution to a very complex issue. "We believe it is crucial to allow the national team to be given equal preparation time to every other team competing in Germany next summer. "This decision follows positive talks involving the FA, Premier League and Football League to find an appropriate solution to protecting the tradition and heritage of the FA Cup, while allowing for Fifa's four-week window between the end of all major domestic seasons and the start of the World Cup." The revamping of the world's oldest domestic Cup competition may be seen by some as devaluing its prestige. But the FA pointed out that in the past five seasons, only three sixth-round ties have required a replay. Fifa had allowed the FA special dispensation to play the final on 20 May. But Eriksson was insistent that England players get the same four-week preparation time before the World Cup finals that other countries will. The FA had considered moving the final to a midweek date to help achieve that, but the idea was swiftly dropped.